At ProRez Coatings, we see elastomeric polymers as more than just a crack-bridge material, or a flexible waterproofing membrane for elevated concrete decks, parking garages, mechanical rooms, and mezzanines that may be subject to frequent movement and/or heavy stress exposures. True, the flexibility of elastomeric floor coatings can help protect the concrete substrate against water, cracking and other stress damage, but they can also beautify concrete, tile, and wood substrates with decorative and stylish appeal when combining either specially blended rubberized granules or polymer flakes to create the ProRez FlexFloor systems. The low odor, 100% solids FlexPoxy and FlexSpartic hybrid systems offer excellent built-in adhesion, flexibility, strength and durability. When combining blended rubber granules or polymer flakes as a broadcast system into our FlexPoxy, slurry base matrix of 1/8”-3/16″ in thickness, this highly resilient floor resurfacing finish can provide noise attenuation and footfall shock absorption for a degree of comfort under foot, as well as excellent rebound, deflection, and point-impact resistance. Microbe◊BLOK, a factory installed antimicrobial film preservative is also available when hygiene & sanitation are critical considerations. Like all of the ProRez high performance resins, our elastomeric hybrids can also be field-tinted with our ProColor Universal Colorants. FlexSpartic is a uniquely versatile and proprietary hybrid polyaspartic coating. 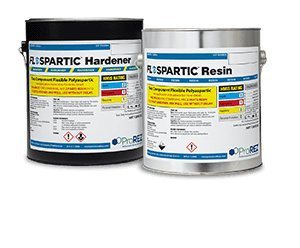 FlexSpartic is a clear two component thermosetting, low odor, 100% solids flexible aliphatic resin designed for various conditions and substrates. Reference technical data sheet for more information. 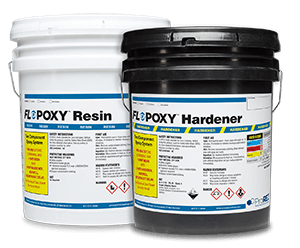 FlexPoxy is a uniquely versatile and proprietary hybrid epoxy membrane and coating. FlexPoxy is a clear two component thermosetting, low odor, 100% solids elastomeric polymer designed for various conditions and substrates. Reference technical data sheet for more information.